Curfew-like restrictions across the Valley; Family still awaits mortal remains. Srinagar: On the sixth death anniversary of the hanging of Muhammad Afzal Guru, a complete shutdown is being observed in Kashmir. Guru was hanged in Tihar jail on February 9, 2013, convicted of being involved in the attack on Parliament on December 13, 2001. The call for the shutdown was given by the Joint Resistance Leadership, which incudes leaders such as Syed Ali Geelani, Mirwaiz Umar Farooq and Yasin Malik, to protest against the hanging of Guru and to demand the return of his mortal remains that lie in the premises of Tihar Jail in New Delhi. At around 8 a.m on February 9, 2013, Guru, a resident of Jageer Ghat Sopore, was hanged in Tihar jail. His execution had created an uproar in the valley as many believed that he was was not given a fair trial. Guru is survived by his wife, Tabassum, and 18-year old son, Ghalib, who live in Tarzoo village near North Kashmir's Sopore town. On Friday, all shops, private and government offices and other business establishments were shut across Kashmir. Public transport was also off the roads. 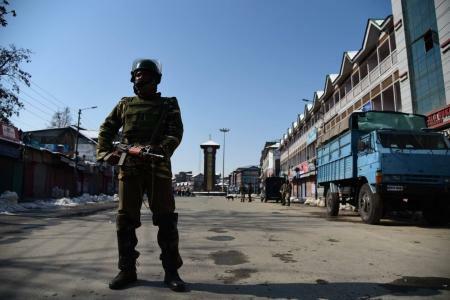 To maintain law and order and prevent possible protests, the authorities imposed strict restrictions in Sopore town in Baramulla district. 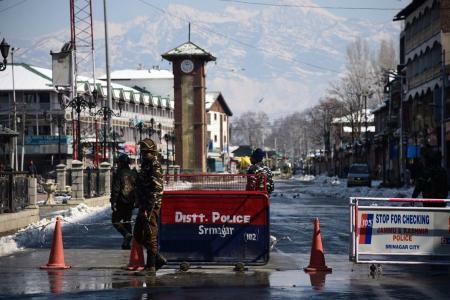 All the entry points leading to Afzal Guru’s home village, Jageer Ghat Sopore, were sealed. 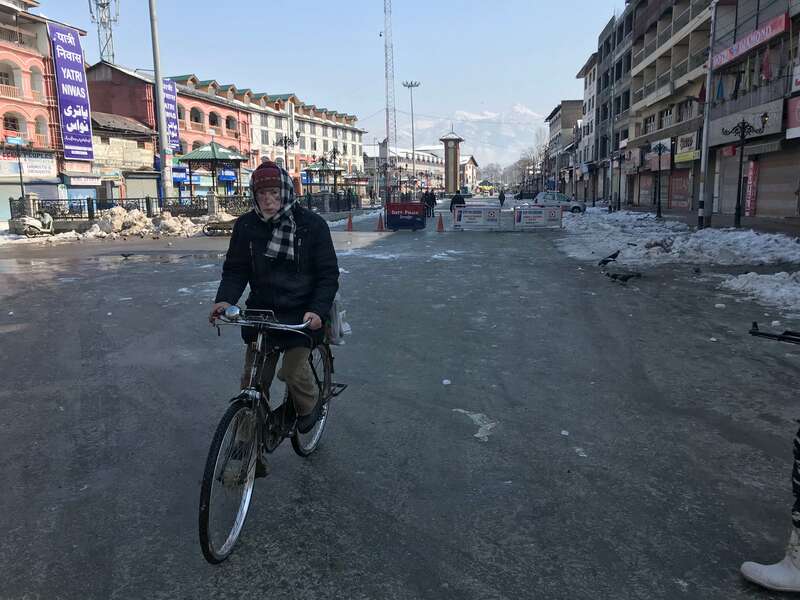 As a result, a curfew-like restriction prevailed in many parts of Srinagar, with entry toward the historic Ganta Ghar (clock tower) also sealed. Almost every person and vehicle was being frisked in the heart of the city. The main entry toward the old city was blocked with concertina wires. A relative of Guru (wishing anonymity) told NewsClick that he was a surrendered militant. In 1989, when Afzal Guru was 20 years old, he crossed the border to be trained as a militant, she said, adding that he returned disappointed with the process and beliefs of the people who used to provide arms training. She further said that in 1993, Guru had decided to surrender to the Border Security Force (BSF). Since then, he was kept under tight surveillance. Like other surrendered militants, he was asked to mark his presence in the army camp and police station concerned, she added. During those years, Guru was arrested many times and was tortured, she claimed, adding that he was asked to provide information to government forces. The relative said government forces used to ask him to provide details and information about militants and their activities. Due to the routine raids, Guru and his family moved to Baramulla main town in 2000 where he used to run a medical shop dealing in surgical instruments. After many arrests and tortures, Guru, who used to provide information to the forces, was eventually given a certificate of facilitating forces by the Special Task Force (STF) a wing of Jammu and Kashmir police who used to deal with anti-militant operation during 90s, she said. When asked about his arrest, she said in 2001, a day after the Parliament attack took place, Guru was arrested from a bus stand in Srinagar when he was boarding a bus for his home town. From there he was taken to the Parimpora police station and then driven to the STF headquarter at Humhama. Later, he was taken to Delhi. On December 15, 2001, a Special Cell of Delhi Police claimed to have cracked the case, and declared that the attack was a joint operation of Lashkar-e-Toiba and Jaish-e-Mohammed. Police named 12 people as part of the conspiracy, including Ghazi Baba of Jaish, Maulana Masood Azhar of Jaish Tariq Ahmed, five slain Pakistani militants, three Kashmiri men, S.A.R. Geelani, Shaukat Hussain Guru, and Mohammed Afzal; and Shaukat's wife Afsan Guru. Only four among these were arrested. A charge-sheet filed before the STF trial court was designated for cases under the Prevention of Terrorism Act (POTA). The trial court sentenced Geelani, Shaukat and Afzal to death. Subsequently, the high court acquitted Geelani and Afsan. The latter was sentenced to five years imprisonment. The Supreme Court reduced Shaukat's punishment to 10 years of rigorous imprisonment. But, Afzal Guru was given three life sentences and a double death sentence. On August 4, 2005, the Supreme Court in its judgement said there was no evidence to prove Afzal Guru was actively affiliated with any terrorist group or organisation when the attack was carried out. The court also said “as is the case with most of the conspiracies, there is and could be no direct evidence of the agreement amounting to criminal conspiracy. However, the circumstances, cumulatively weighed, would unerringly point to the collaboration of the accused Afzal with the slain 'fidayeen' terrorists." On February 2, 2013, Guru was hanged ‘in haste’ even though he was not in line to be hanged. Three years after his hanging, the then Home Minister P Chidambaram said that his involvement in the Parliament attack was under doubt, The Economic Times reported. There was a mass criticism of the hanging as many believed that then United Progressive Alliance government had rushed him to the gallows for political reasons. “I think it is possible to hold an honest opinion that the Afzal Guru case was perhaps not correctly decided,” Chidambaram was quoted saying by the business newspaper. The report is based on an interview of the erstwhile hawk who had been shifted out of Home Ministry before Guru’s hanging. It was Sushil Kumar Shinde who was Home Minister when in 2013 Guru was hanged without even permitting his family to meet him for the last time. “There were grave doubts about his involvement in the conspiracy behind the attack on Parliament and even if he was involved, there were grave doubts about the extent of his involvement. He could have been imprisoned for life without parole for rest of his natural life,” Chidambaram told an interviewer. Six years later, Afzal Guru’s family still awaits his dead body.